In today’s world, an online interview is a common thing especially the Skype Interview. Here we need to be aware of how to prepare and what to ignore when attending an online interview. In most of the cases, employers will ask for a direct face to face interview for technical discussions and HR unless you are located in some remote place or you are on some vacation. If you don't want to attend a direct F2F interview, better to convince your HR or consultancy to schedule it online. 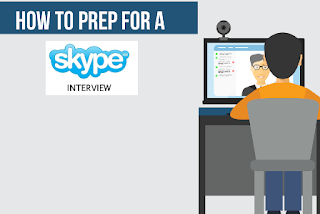 Let us see the few best tips, how to prepare for a Skype interview. Be ready with your Skype account. If you are a first time user, go through the guide and videos 'How to use Skype video conference?'. Check your internet connection and not allow anyone to download anything for that particular time. Better to use Laptop If your area has frequent power cuts. Make sure that your headphones and mic are working without any unwanted sound, disturbance. Check your visuals are clear in Laptop web camera. Alert your roommates not to disturb during the time of interview and try to choose a pleasant room away from the roadside. Don't rotate your head without any reason. It will create a wrong impact. Feel very free and try to complete the interview in a short time(less than 40 minutes). All the above are the basic and the best tips that help in a successful Skype interview preparation.